Thank you for visiting us! We offer quality stallions and youngstock bred for eventing. Please take a few moments to look around and feel free to contact us for additional information! Bonne Nuit-Sired a dynasty of champion show jumpers, including several horses that competed with the US Equestrian Team and internationally including Night Owl, Out Late, Night Spree, Riveria Wonder and Circus Rose. Good Twist-Grandson of Bonne Nuit. US and European Grand Prix jumper. He won more than 21 international equestrian classes as a USET member and sired Gem Twist, who won the team silver at the 1987 Pan Am Games and 2 silver medals at the 1988 Olympics in Seoul, Korea. Gem Twist also won the American Grand Prix Association Horse of the Year award in 1987, 1989, and 1992. Good News Joe-US Grand Prix jumper. Wait a Bit-Well known jumping sire in US. Janes Bit-AKA "Tomboy." Grand Prix jumper, won individual and team gold medals at the Pan Am Games. Represented the US at Tokyo Olympics in 1964. Nasrullah-1940 TB. Distinguished as the English Champion in 1942, immigrated from England to US in 1949, when purchased by A.B. Hancock for $400,000. Became the sire of Bold Ruler and Nashua. Was a leading sire for many years-1955-56, 1959-60, 1962. Sire of 98 Stakes Winners including Nashua, Bold Ruler, Bald Eagle, Never Bend, Never Say Die, Noor, Nasrina, Leallah, and more. 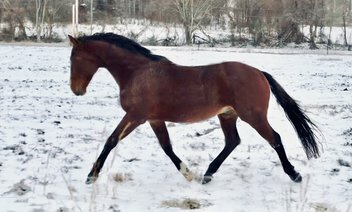 Today many of the most successful AQHA speed horses trace their pedigree to Nasrullah.